Make the most of your holiday in Oideas Gael this summer: for the second year running you have the opportunity to take an oral exam and earn Teastas Eorpach na Gaeilge (TEG) certification. TEG is the first and only system of certification for adult learners of Irish. The TEG system has been in place since 2005 and exams have been taken by more than 2,500 adult learners of Irish both in Ireland and abroad. TEG examiners will come to Gleann Cholm Cille on 12 July and 26 July 2014 to conduct oral exams. Students attending courses in the weeks preceding these dates will have the option of taking an exam. Students who pass the oral exam will be awarded TEG certification of their speaking skills. Advice regarding the most suitable exam level for you will be available from Oideas Gael teachers and from the TEG team at NUI Maynooth. The exam fee of €50 can be paid in Oideas Gael on the examination day. More information and a link to the registration form is available here. It is necessary to register by 10 July for exams taking place on 12 July. Applications must be made by 24 July for the 26 July exam session. 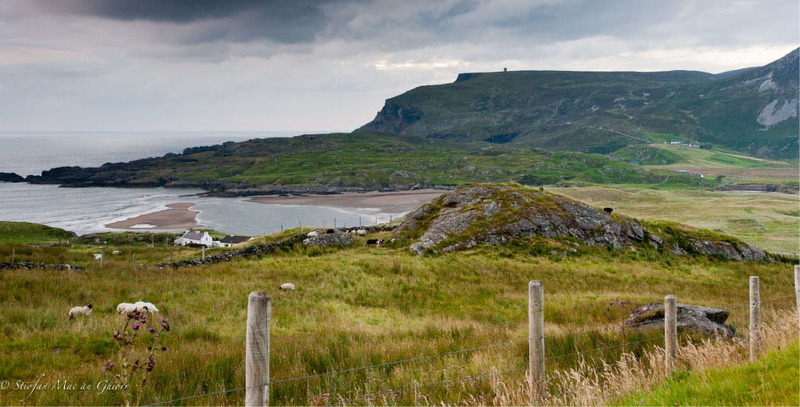 Visit Oideas Gael, one of the hidden gems of Donegal’s Gaeltacht area and leave with Irish language phrases that will connect you with the people you meet on your wild Atlantic Way journey. Oideas Gael has attracted hundreds of participants annually to its highly acclaimed language courses and cultural programmes. Irish people, drawn from all backgrounds, constitute up to half of those attending, while the remainder travel, especially from numerous other parts of the world, to attend. 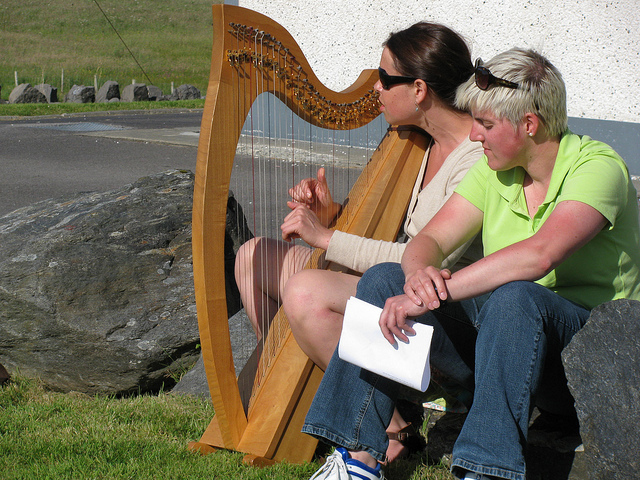 The unique blend of expertly prepared courses, together with an attractive mix of cultural sessions, all located within Gaeltacht communities, enable learners to improve their fluency in Irish while, at the same time, enjoying our living culture. As an alternative to the graded language courses, a broad range of cultural activity programmes is offered to participants interested in experiencing a unique style of learning holiday. 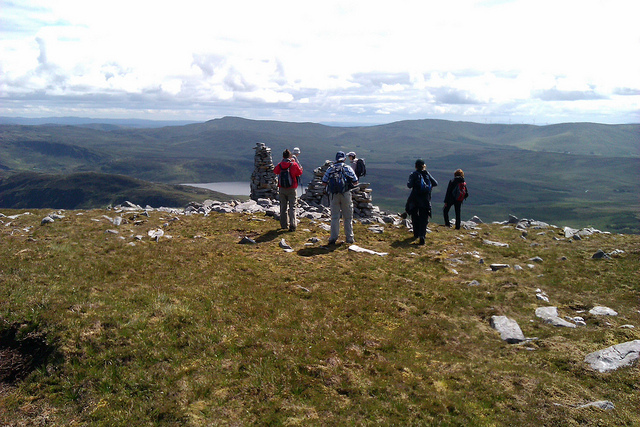 Our experienced guides lead week-long and weekend hill walking courses that are suitable for novices and experienced walkers alike. Why not start a trip along the Wild Atlantic Way with a visit to Oideas Gael and see all that Gleann Cholm Cille has to offer? Take a look at our website and download the full list of the 50 Secrets of the Wild Atlantic Way. 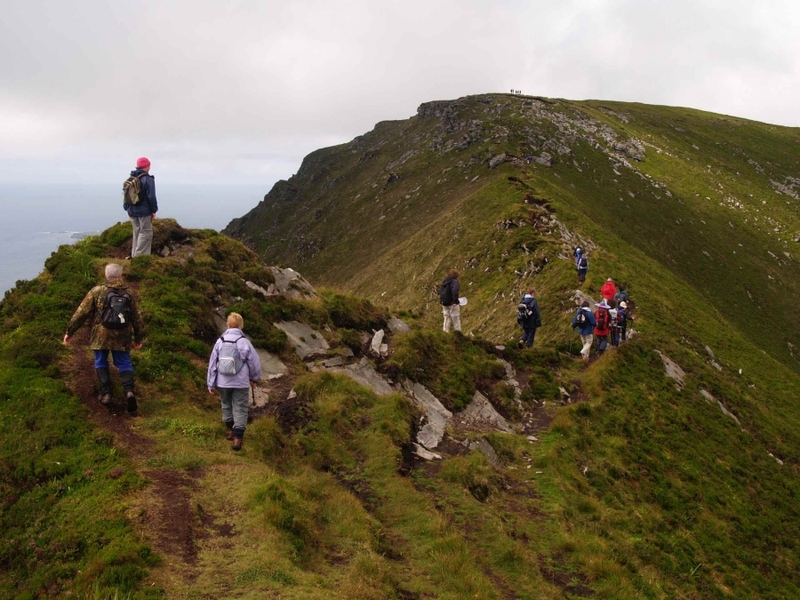 This April 19th, to celebrate Pilgrim Paths Day 2014, you are welcome to come join us as we walk Turas Cholm Cille, a three hour pilgrimage walk and one of the oldest traditions in Gleann Cholm Cille. 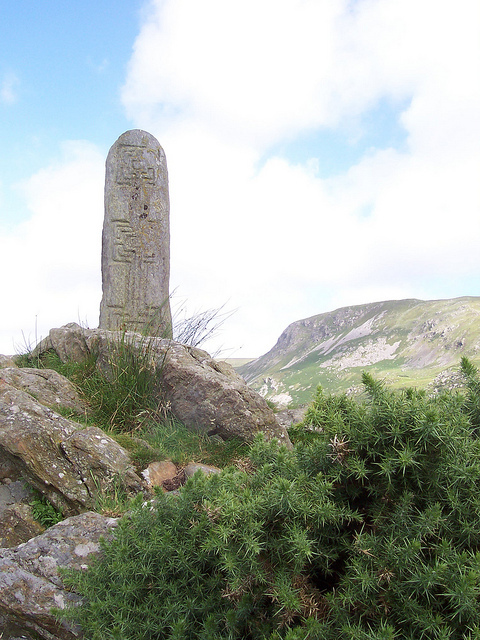 The stations of the Turas consist of megalithic tombs, natural landscape features and cross pillars. Our friend Howard Goldbaum has created a comprehensive guide to the Turas on his excellent Voices from the Dawn website. National Pilgrim Paths Day is a new Easter Festival based on Ireland’s dense network of medieval pilgrim walking routes. This new heritage themed event is organised by the local communities adjacent to each of our principal penitential routes and is aimed at raising awareness of Ireland’s rich inheritance of pilgrim paths. It is targeted, not only at those who enjoy exploring ancient tracks imprinted with the footsteps of our penitents past, but also at the growing numbers seeking walkways with deeper spiritual significance. 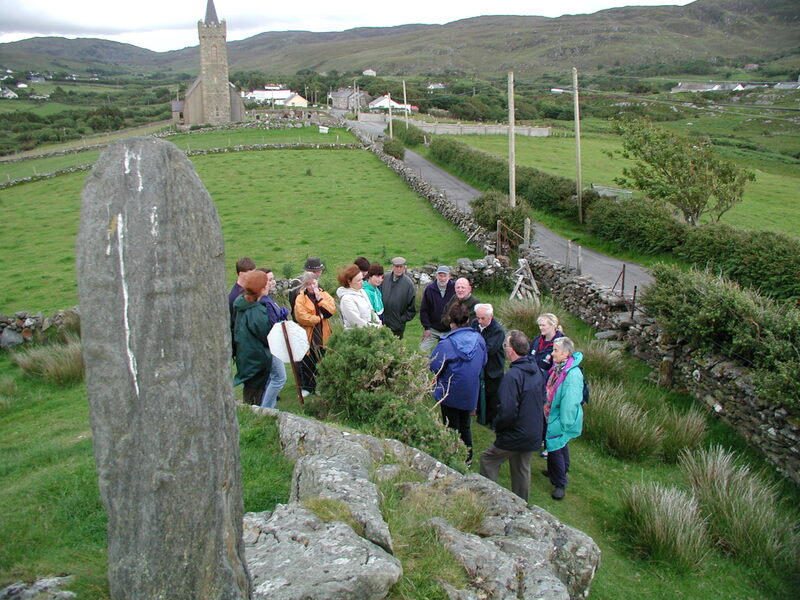 Easter Saturday, April 19th 2014, has been designated Ireland’s first National Pilgrim Paths Day with a nationwide series of walks planned along all of this country’s major medieval, penitential walkways. Overview: A three hour penitential pilgrimage around the Glencolmcille valley, usually conducted barefoot around 15 stations/cross slabs, church and well. Suitability: Rain gear & strong walking boots required. Some hill for 300 metres and soft ground in others. Otherwise along road and paths. Getting there: Take R263 from Donegal Town through Killybegs, An Charraig, to Gleann Cholm Cille. The second stop on the Turas Cholm Cille, one of Gleann Cholm Cille’s oldest pilgrimages. Pilgram Paths Day 2014 will be officially launched by broadcaster Mícheál Ó Muircheartaigh in St. Patrick’s Cathedral, Dublin, at 11:30 am on March 31st. For more information see the Pilgrim Paths website, e-mail us at oideasgael@eircom.net or call (074) 9730248. We’re delighted that Liam Ó Cuinneagáin, Oideas Gael’s Educational Director, has been named Donegal Person of the Year for 2013. 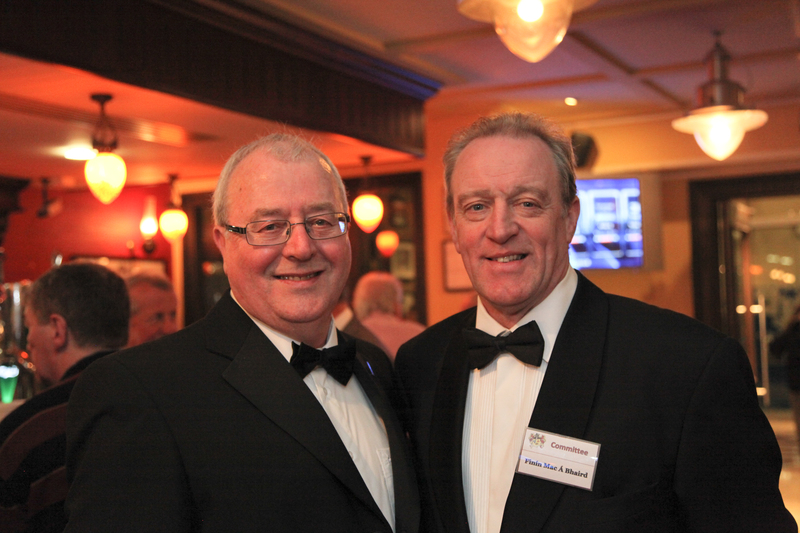 He recently received the award at a special gala dinner in the Regency Hotel, Drumcondra, Dublin. Liam took the opportunity to emphasise that Irish is a “good news story” with thousands of adults in Ireland and around the world eager to learn and to use the language. The Donegal Association, Dublin, presents this accolade annually. Fr. James McDyer, another noted person associated with Gleann Cholm Cille, was the first person to receive the honour in 1978, and famed folklore collector Seán Ó hEochaidh, of Teileann, is among the other awardees. Jim McGuinness, manager of the Donegal Gaelic football team, was last year’s recipient. Liam with Finín Mac a’ Bhaird, Donegal Association Committee. Liam spent over twenty years as a primary teacher and school principal in Dublin. Liam and his co-founder Prof. Seosamh Watson established Oideas Gael in 1984 with the aim of enabling adults to enjoy learning Irish in a natural and supportive environment while helping strengthen the Gaeltacht communities of Gleann Cholm Cille agus Gleann Fhinne through local enterprise. Liam was chairperson of Oireachtas na Gaeilge (1991-1994) following the festival’s visit to Gleann Cholm Cille in 1989. He spent ten years (2002-2012) as chairperson of Údarás na Gaeltachta, and at present he is a member of the Donegal County Tourism Board and a board member at the Donegal Enterprise Fund. Oideas Gael was awarded the Board Fáilte/AIB Rural Tourism Award 1997. Liam was named the Rehab/AIB Donegal Person of the Year in 1997 also. He is a recipient of the UCD Bord na Gaeilge Alumni Award (2008) as well as Gradam an Phiarsaigh (2010) for his contribution to Irish education and the promotion of the Irish language. 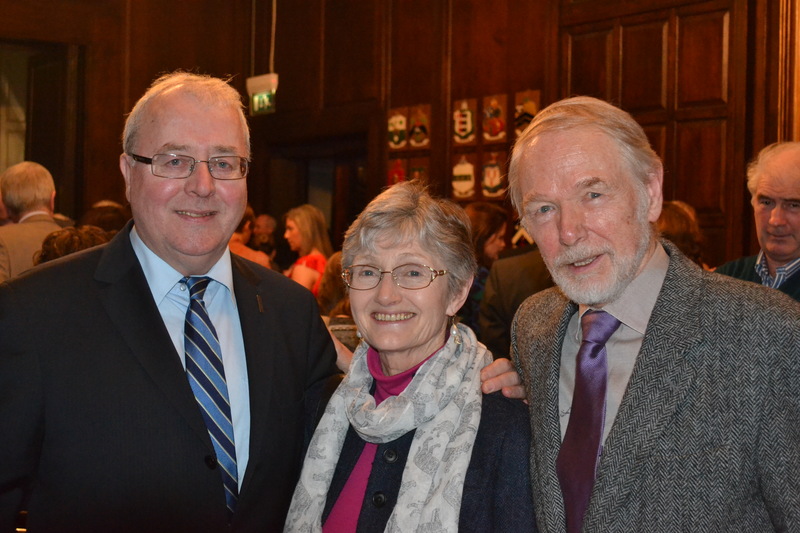 Liam Ó Cuinneagáin with Oideas Gael co-founder Seosamh Watson and his wife Vivienne at the announcement of the Donegal Person of the Year 2013 in the Mansion House, Dublin. At the award ceremony, Liam said that the award of Pearsa Thír Chonaill was particularly special and that he was proud to receive it. He said that we would accept the honour on behalf of all those who are active in the promotion of the Irish language, especially those located in Gaeltacht communities around Ireland. He referred to the Irish diaspora around the world and the work they do to spread the language. Liam noted the large number of people who have been encouraged to learn Irish as a result of the positive attitude and commitment of these ambassadors. Half of the attendees at Oideas Gael each year come from countries outside of Ireland and Oideas Gael is committed to providing the best teachers and learning materials to empower these learners. Liam paid special tribute to his friend and Oideas Gael’s co-founder, Prof. Seosamh Watson, to the communities of Gleann Cholm Cille and Gleann Fhinne, and to the friends and supporters of Oideas Gael around the world. We were very happy to welcome two long-time friends of Oideas Gael, Liam Guidry and Stiubhard Cassell, who travelled from the United States to be with us on the night. Liam Guidry, Daltaí na Gaeilge, Finian McGrath, T.D., Liam Ó Cuinneagáin, and Stiubhard Cassell. You can view photos from the award announcement here and from the award ceremony here.